In order to help consumers make the right decision, every year, The Car Guide announces its Best Buys in all passenger-vehicle categories on the market. 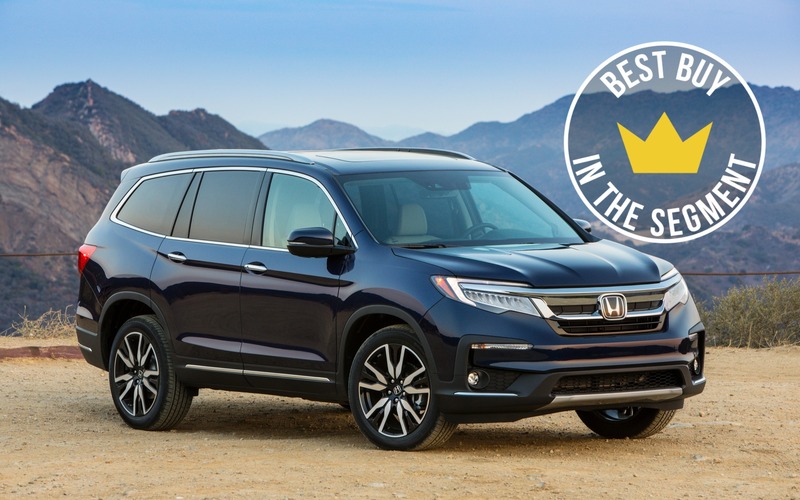 In the midsize SUV segment, the 2019 Best Buy title goes to the Honda Pilot. For the 2019 model year, the third-generation Pilot benefits from revised grille, bumpers, taillights and alloy wheel designs. In addition, a new Black Edition variant boasts a sinister, monochrome appearance that we find quite pleasing. Since its introduction in 2003, the Pilot offers a cabin that can comfortable seat up to eight passengers, and this formula hasn’t changed since. The VUS obtains a new infotainment system with a real volume knob, while features such as CabinControl (for controlling audio and climate settings through a smartphone) and CabinTalk (a built-in PA system so front-seat passengers can talk through the 2nd- and 3rd-row speakers) have been added as well. Parents and children will appreciate family road trips even more! Honda reprogrammed the nine-speed automatic transmission in order to make perform better, while the automatic start/stop system runs more smoothly. We love the 3.5-litre V6 that produces 280 horsepower and allows for a maximum towing capacity of 5000 lbs. (2268 kg). While not perfect, the Pilot’s reliability record is a plus, as is its ride comfort and driving dynamics. The Pilot starts at $41,090 before freight and delivery charges, and all-wheel drive is included. In second place, we find the Chevrolet Traverse (MSRP from $38,300 with AWD) that impresses us by its spacious and comfortable cockpit, its excellent infotainment system and its list of advanced safety features at a reasonable price. Third place goes to both the Volkswagen Atlas (MSRP from $39,790 with AWD) and the Subaru Ascent (MSRP from $35,995) for their versatile cabins, their fun-to-drive factor and their capable all-wheel drivetrains.